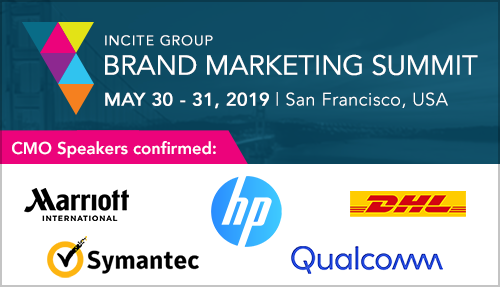 Marriott, HP, Airbnb, Google Join Global Brands Confirmed for Incite Brand Marketing Summit. Over 350 Chief Marketing Officer and marketing leaders to join two-day senior conference dedicated to delivering effective, innovation-driven marketing. According to the Incite Group’s 2019 State of Marketing Survey, the “Customer Experience” (21%), “Brand Storytelling” (17%) and “Understanding Customers” (15%) are the greatest priorities for CMOs this year. Yet the same survey found more than 50% of those same brands are attempting to deliver exceptional marketing on relatively small budgets of $100,000 or less. Marketing Today is heading to The Brand Marketing & Social Media Marketing Summit in San Francisco, May 30-31. Use the discount code ‘AlanHart’ to get a $200 discount on your registration.